An oddly fast-paced race is on to boost the global snail supply. Demand has been boosted by recent pharmaceutical and cosmetic applications for snail flesh and shells. Plus, the free-range snail population is decreasing and they are becoming harder to find. Bulgaria is well-placed to establish itself as a major market player in 2010 – assuming no-one starts complaining about the taste of farmed snail meat. 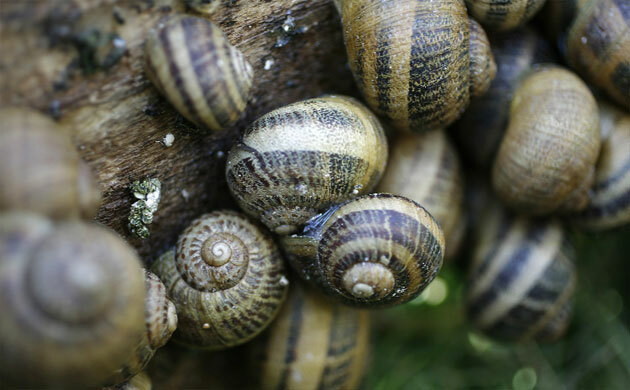 Bulgaria exported around 850 tonnes of snails and snail products in 2009 – six times more than the previous year. In 2010, exports and prices are expected to double, according to Simona Mollova, the CEO of Bulgaria’s National Snail Breeding Cluster. “Because the vacuum on the international market is so big, producers are able to set their own prices,” says Mollova. Start-up costs are low and many Bulgarian farmers, disappointed by post-Communism agriculture, are looking to snails. Mollova expects 300 new Bulgarian snail farms to start up in 2010. New products to enter the market in the coming year will include orange-coloured carrot-fed snails that also taste of carrots, as well as mint-flavoured snails. Yum. New blends of snail caviar will also appear on the shelves of European shops. Although the most popular edible variety, Helix aspersa, is not a native to the country, Bulgarian-raised snails have three advantages: ecological cleanliness and rich soil; naturally occurring digestion-helping bacteria such as Lactobacillus bulgaricus (of which Mollova’s fellow countrymen are understandably proud); and low production costs. Plus snails are a green food. The farming is done by hand and is chemical-free. This is not because of the beliefs of farmers, Mollova says. Rather, there are simply no machines with enough finesse to do the work. Bosnia’s biggest foreign investment: Bonanza or threat? Copyright © 2019 Matthew Brunwasser Journalist.